1 Preheat oven to 400°. Brush salmon evenly with Hellmann's® or Best Foods® Sunflower Oil with a hint of Lemon Mayonnaise Dressing, then arrange on baking sheet. 2 Bake salmon 10 minutes or until fish flakes easily with fork. 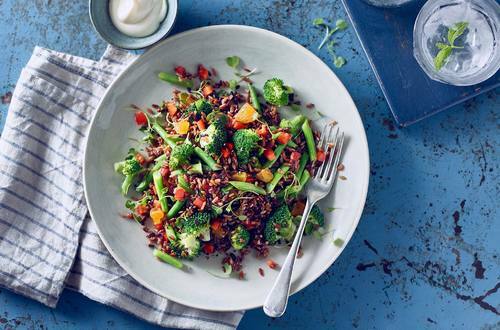 3 Meanwhile toss wild rice, watercress, green beans, bell peppers and broccoli florets in large bowl. 4 Serve salmon on top of wild rice mixture and serve with your favorite dressing.